The album was originally released in 1994. The artwork of the UK release of Promenade was also used for all the other editions: France, Japan. But these are different prints, these times the back cover always features a different barcode number. Unlike Liberation, this time it was not distributed by EMI and the release does not feature an EMI serial number. 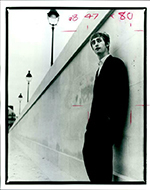 The UK pressings feature in the sleeve the reference ‘SET CD13’ above the photo of Neil Hannon in a staircase. The first editions came with an opaque CD case tray, which looks rather old and strange by now since the photo behind cannot be seen clearly. However, most of the original cases must have been replaced on second-hand editions by now. 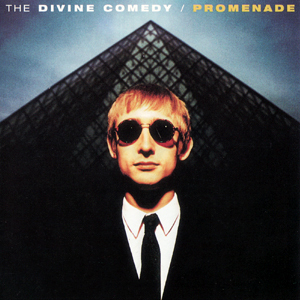 When Promenade was initially released in the UK in 1994, there was a limited 2 CD edition. The CDs are in a 2CD jewel box with a blue sticker, and the other CD is called A Promenade Companion. The Companion CD is one of the rare items that most of DC collectors are looking for, but the 2CD edition of Promenade is a rarer item as the Companion CD was also sold to the audience at some gigs in 1996 or given away for magazine subscriptions. The artwork of the limited edition is exactly the same as the standard edition, but the sleeve’s paper may be thicker. Also, despite we can read the same inscriptions on the CD as the first edition (NIMBUS SETCD 13 CDMA) which may means they comes from the same pressing plants, the printed colours on disc (and perhaps on sleeve) are lighter. 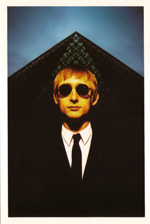 In late 1996, the Divine Comedy catalogue became distributed by Vital in UK; then in many listings appears the reference to a 1997 release with the serial number 5 021299 701329. However, it seems that those copies were almost identically reprinted, so without a different bar code, but with some minor differences. First they came in regular jewel box with a transparent case tray. The printed colours are definitely lighter (it can be well-spotted on the back cover), while on the CD the print quality is poorer, and the title at a different place. Around the centre of the disc we can read: B0935 SETCD 13 IFPI L123 MASTERED BY NIMBUS IFPI L123. Some of them came with a Casanova-era card to subscribe to the band’s newsletter like the one which was given away with singles from that period (see The Frog Princess). Promenade was also released as an LP. The front cover is the same as the CD and the back has a similar design to the Liberation LP. 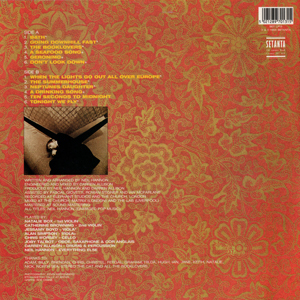 Over a background, made with the red flowers pattern, are printed the tracklisting, the credits, as well as the photo from the CD tray inlay. On the right there is a barcode and a Setanta logo (note that none appears on the CDs). On A-side, the label also features the red background, with a circular design of the title. On the disc is etched: MPO SETLP13A2. The other side still has the same background, and features tracklisting of both sides among usual information. On the disc is etched: MPO SETLP13 B 1 FOR THE TIME BEING. For collector maniacs eventually, there also exists a tape version of Promenade. The artwork uses elements from the CD, but, as on the LP, they are set in a different way. The front cover is the same as the CD, but with the full rectangular photo and the title on 2 lines without the ‘/’. The side and the back have the red flower pattern as background with the title (with the ‘/’ this time), the tracklist and the barcode. The inside of the sleeve includes colour photos on one side and, as on the CD, the tracklist with the symbols * and + in the credits. The other side is black and white only and features the credits and the photo of Neil by the Louvre Pyramid in a black frame. Finally, behind the side is hidden a Setanta logo. On the tape, once again, you can read the name of the group and the title of the album separated with a ‘/’. Underneath, you can read the usefull mention ‘For full details see inlay’, and the catalogue reference. Below, there is the side letter and copyright notice ‘℗ & © 1994 Setanta’. As many albums, Promenade also get its promo CD. It is a red CD with the tracklisting on it. You can notice the names of the songs aren’t exact: ‘The Book Lover’ in 2 words, ‘When The Lights Go Out’ without ‘All Over Europe’, 10 instead of ‘Ten Seconds To Midnight’, ‘THE Seafood Song’, ‘Drinking Song’ (without the ‘A ’) and ‘Setanta’ is mispelled ‘Setana’. There is also another version of a promo CD of Promenade. But actually I don’t know if it is really a promotional CD, or just a CD-R and so a fake bootleg promo. 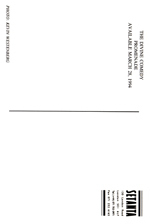 For the promo of the album, Setanta released a postcard which features the complete photo of the front cover of the album without the title written over it.